Today, it was very exciting for me to see our sweet Aram. Her dad is so happy about the good progress in his daughter’s life. When I went to visit her, the doctor was removing her chest tube. She doesn’t have a nasal canula or nasogastric intubation. Also her oxygen level is good. She is doing well, praise the lord! Please continue praying for this beautiful baby, for fast and complete healing and that they can go home soon. As it was my first day at the hospital, I was a little shocked when I saw baby Aram. I had just so much compassion for her. It took her so much strength to breath and she couldn’t even cough (things that are as a matter of course for me). Besides her arms and legs were way too tiny for her age. Thank God that she probably doesn’t need any more surgery! 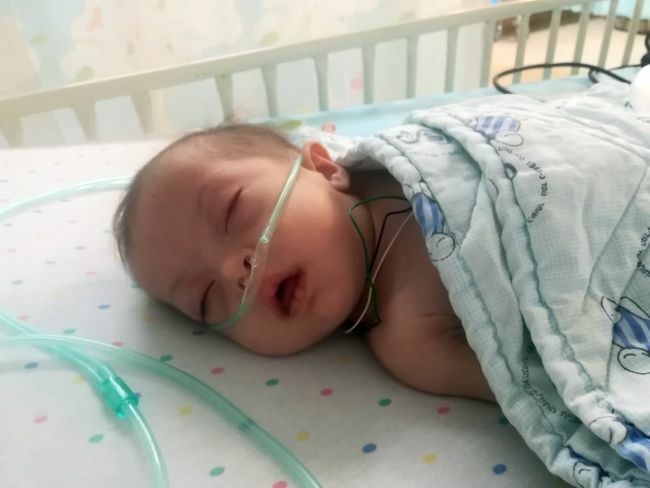 Aram has been moved to secondary ICU and from the three chest tubes she had, there is only one remaining. Let’s honestly thank God that Aram is on the mend! And let’s pray that she will gain strength and get the energy a child her age should have! 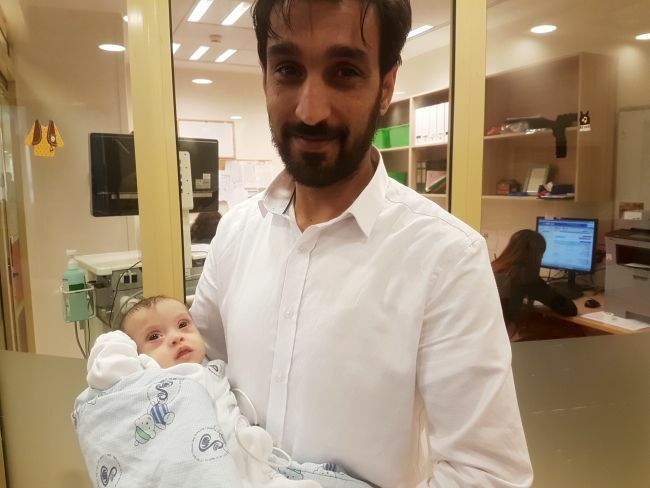 We arrived at the hospital just after baby Aram had gone in for surgery; her father did not seem anxious, but at ease as he strolled around the hospital. However as the hours wore on he eagerly awaited seeing his beautiful daughter again. 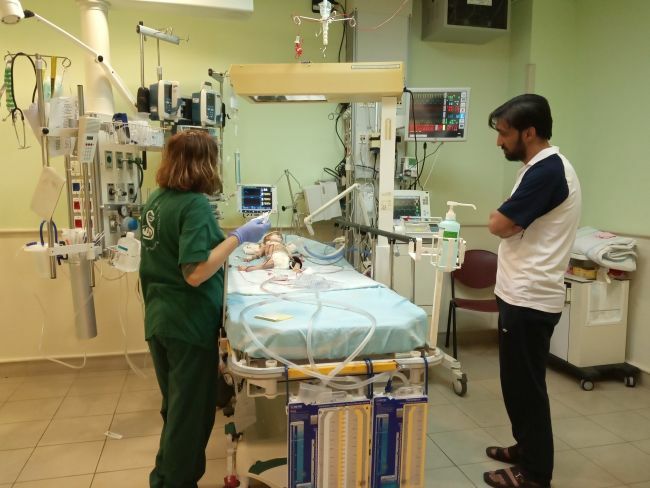 We waited for the last half hour in the room the nurses prepared for her in the ICU, and one moment the two of were sitting conversing about our families and then the next moment, a rush of doctors and nurses swept in pushing the very hospital bed where Aram lay. 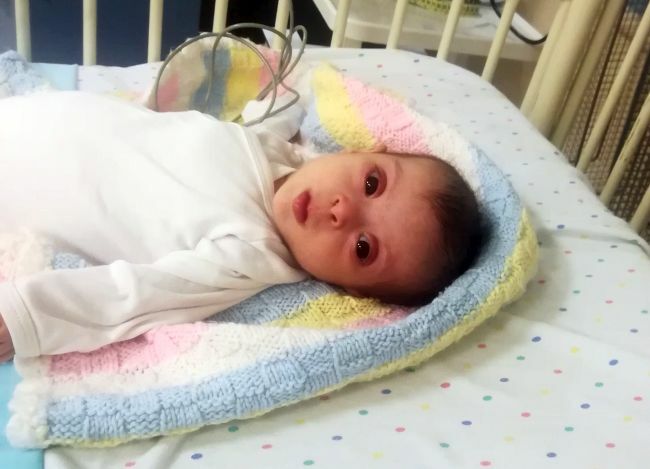 The surgeon told her father in Arabic that the surgery went well, but after she was disconnected, her blood pressure dropped. We then were asked to go to the waiting room while the nurses got her set up in her new room. During that time we were in the ICU waiting room, Birhat’s mother came in and brought us juice to drink and biscuits to eat in celebration of Aram’s successful surgery. I listened as Aram’s father spoke tenderly to his other children over video chat; I saw how good of a father he is, and was reminded of our Father in heaven who tenderly cares for each of us, who overlooks no one not even a tiny, sick refugee baby. God is faithful to see Aram through her surgery and also through the recovery process. Please join us in thanking Jesus for her positive surgery outcome and continuation of intercession for her healing, as she is on 100 percent oxygen and two medications to keep her blood pressure up. When I went to visit our sweet Aram, she was sleeping. Her nurse told me that today was a really busy day for our little Aram. In the morning they performed a head ultrasound, kidney ultrasound and an echo. All of these things were needed before she can have her surgery. So she is ready to have her surgery soon! Also she is no loner in respiratory isolation. She is doing great waiting for her surgery in the hospital. But we don’t know when she is going to have the surgery. Please pray for open schedules for her. Her dad is amazing; he was very happy that his beautiful daughter is finally going to have her surgery soon. God really timed our steps as a hospital visiting team today. This was much the case with Aram today. As I arrived to visit Dad and Aram the nurse informed us that she would now be taken for her catheterisation. Tiny Aram was carried down to the preparation area in the arms of her loving Father. It was lovely to watch the two reciprocally babbling to one another as the doctors arrived to discuss the plan for the procedure. Dad was very calm as Aram was carried away into theatre. Aram had an exploratory cath which took around 3 hours. The doctors were able to gain the information they needed and are now happy to proceed with surgery in the near future. Praise God for this successful procedure and for the beautiful life of Aram. Please pray that her surgery is able to be scheduled soon and that her father may come to know Jesus as his daughter’s healer. It was a bit disappointing this morning to learn that Aram was unable to have her catheterisation as she has a fever. However, we trust in the Lord’s timing and we know that the plans he has for Aram are more than we can know. It was lovely to see Aram and her dad in the hospital. Aram has already managed to melt most of our hearts at Shevet. Her beautiful sustained eye contact and communicative babbling help us to remember that this tiny newborn-sized baby is in fact 7 months old! 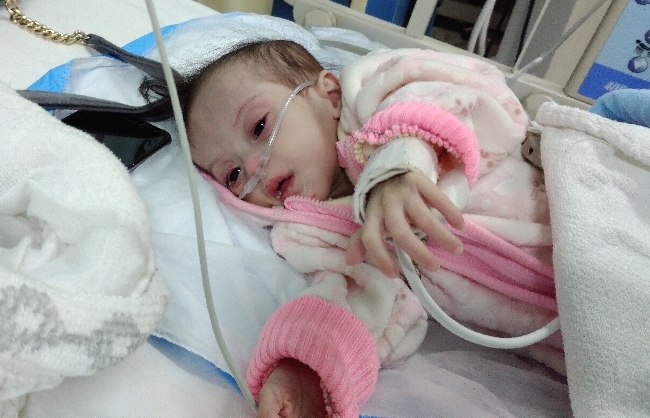 For now, Aram will remain in hospital, hopefully she will have her catheterisation early next week. 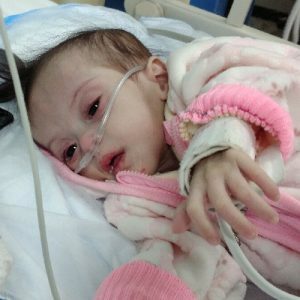 It was clear that the doctors too were surprised by Aram’s appearance a she is very small and thin. I am so excited to see how this daughter of God can be changed and healed during her time here. I pray that the physical changes we will see in Aram’s life will also be experienced spiritually in the life of her father. 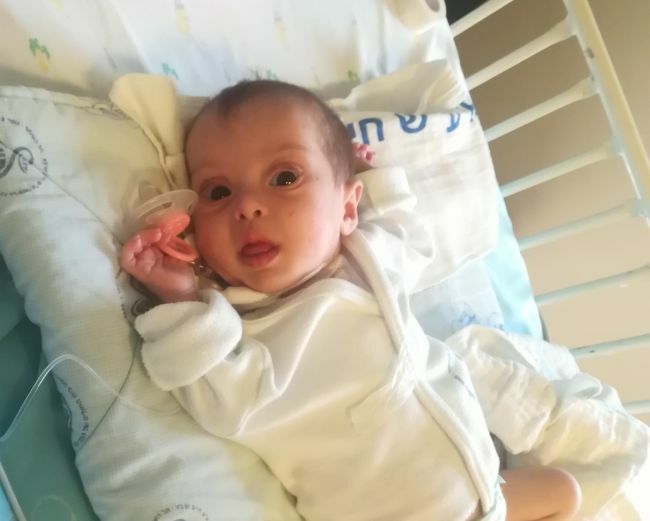 Our beautiful Aram arrived to Israel this past Sunday with her lovely father. 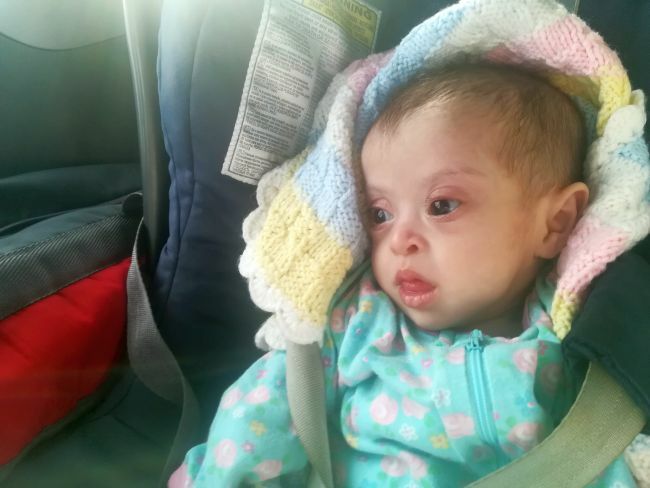 Aram is a beautiful baby with Down syndrome – she is very thin and small for her age. 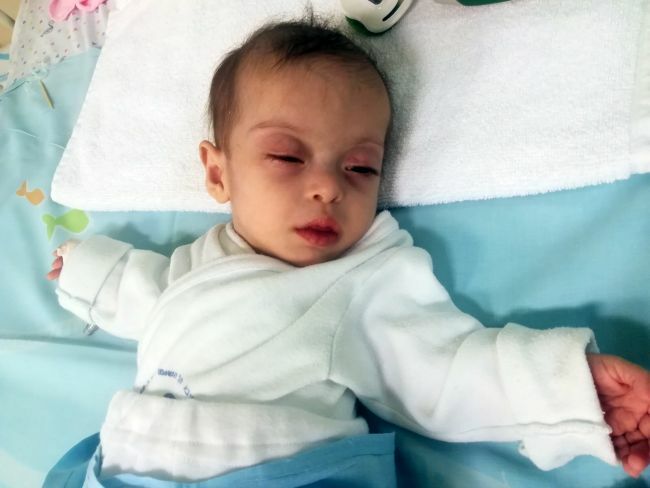 Very early this morning we took our sweet Aram and her father to Sheba hospital for her first assessment. During the echo she cried only a little bit – she is so cute and so brave! Her echo showed that her lung pressure and systemic pressure is very high. The doctors decided to admit her today for a cath that will take place tomorrow. They want to know if she can resist the anesthesia and some medication, after that they can make the decision to operate or not, and if yes then what kind of surgery. Please pray for this little baby, for wisdom to the medical team, and for the best plan for her. 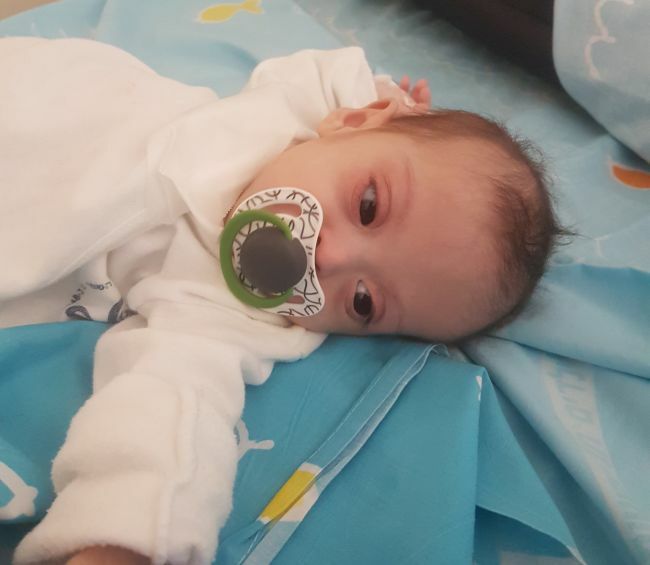 Today we found baby Aram gasping for life in the ICU of a children’s hospital, in her family’s country of refuge from the Syrian civil war. It was a joy to bring hope to her young mother, and also to the medical staff in the hospital. 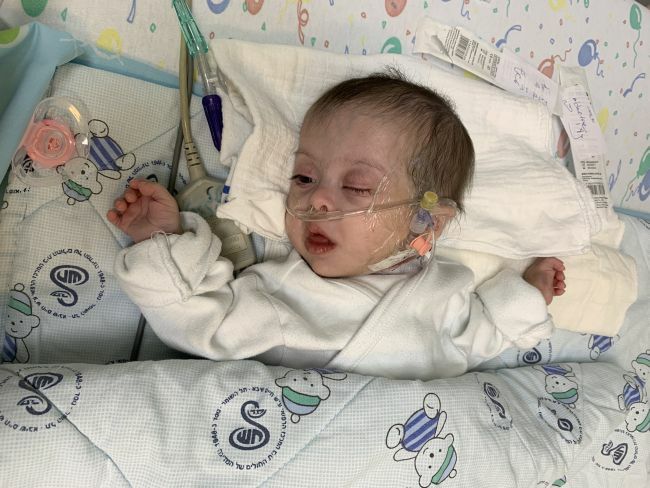 They’ve been fighting to keep her alive, even though there didn’t appear to be any way in that country for Aram to have the heart surgery which can allow her to live and grow. It’s a simple message we carry: every life is precious, and we cannot turn away from a dying child when it is in our power to give her the care that she needs. 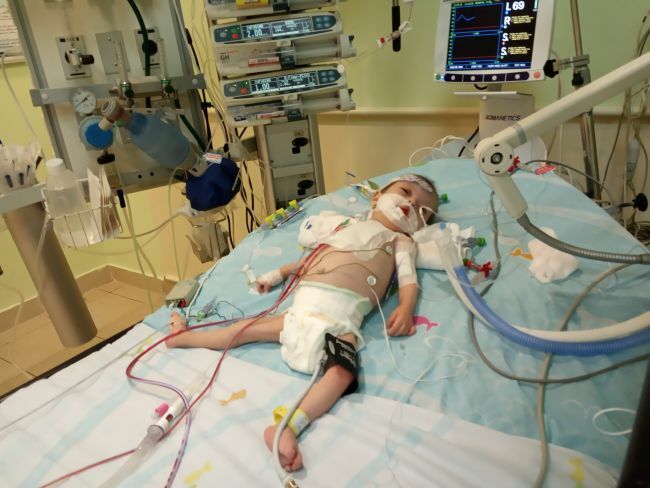 As soon as the family can arrange passports we hope to bring Aram to the Sheba Medical Center in Tel Aviv. As of right now, Aram still needs $6310 toward surgery and related expenses.